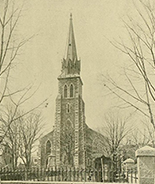 Established in 1831, St. Patrick Parish is the oldest Catholic Parish in Greater Lowell and the third oldest in the Archdiocese of Boston. Since its establishment, St. Patrick’s has stood tall in the heart of the Acre neighborhood as a community committed to spreading the Gospel of Jesus Christ. Today, beyond a history of serving Irish and French parishioners, the parish offers native language pastoral care to communities of Hispanic, Vietnamese, Cambodian, and Burmese Catholics. St. Patrick’s is a stable and historic example of God’s presence amidst an ever-evolving neighborhood landscape.